United Nations' Food and Agricultural Organization states that there are 354 species of sharks, ranging in length from 6 inches (15 centimeters) to 49 feet (15 meters). Of all these predators, the bull shark has the strongest bite. According to U.S. researchers and European colleagues across the world, the bull shark has the strongest bite of any shark. University of South Florida professor, Maria Habegger, stated that "bull sharks, in relation to their body size, bite harder than other, larger predatory sharks". Bull sharks can reach a length of 12 feet and are found in warm, shallow waters. Bull sharks have also been found in both brackish and freshwater systems, such as rivers. They are named for their "large, stout heads and aggressive behavior." They are apex predators and rarely are attacked by other organisms. The collection of researchers "analyzed the bite forces of 13 species of shark" and determined through the "examination of the jaws and jaw muscles, that bull sharks can bite with more than 1,300 pounds of force. "Bull sharks are known to prey on dolphins, turtles and other sharks. 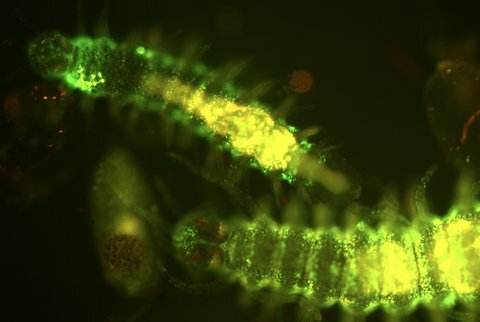 Scientists have identified the green glow seen by Christopher Columbus over 500 years ago as Odontosyllis- a genes of worms commonly known as fireworms. These bioluminescent worms are the source of the "circular mating dance before the twice-monthly quarter moon", that are often mistaken for reflections from the night sky. The worms reach up to 15 millimeters in size and are found in shallow coastal areas. These areas include the coastes of Southern California, Puerto Rico, Belize, Bermuda and sometimes British Columbia. Scientists suspect that their diet consists of coral and sponges found on the ocean floor. Dimitri Deheyn of the Scripps Institution of Oceanography stated that the "females swim in luminescent two-inch circles, while the males follow them, glowing in bursts of light." The breeding show only lasts for 20 to 30 minutes after sunset, so as to not attract predators. Scientists have identified the source of their bioluminescence as photoproteins. These photoproteins are being applied to medical studies in hopes that the genes responsible for photoproteins will illuminate cancer cells or apoptotic cells. The Tonga Trench in the South Pacific is the second deepest trench in the world, only beaten out by the Mariana Trench. The Tonga Trench is 35,700 feet deep at it's deepest point, only 56 feet less than the Mariana Trench. The goal of exploring the Tonga Trench is to gain a better understanding of the deep sea ecosystem. The Tonga Trench, along with other deep sea trenches, are home to a unique set of organisms that can withstand the immense pressure and extremely low water temperatures. The water is about 34 degrees Fahrenheit- on the verge of freezing. A very talented and experienced group of scientists and graduate students journeyed to the South Pacific to collect data. The scientists originally planned to use wires to measure pressure, temperature, and take samples, but the trench is so deep that there were no wires long enough to reach the required depth. Instead, the team used deep sea robots that were able to take pictures and collect water samples. After the robot was done sampling, it would release it's ballest weights and float to the surface. The robots also "recorded ambient sound in the deep ocean and...[retrieved] 5-foot cores of mud from 30,000 feet." The samples were then "stored at pressures equivalent to the deep sea, and at fridgelike temperatures to keep the microbes intact and alive to be studied." Overall, it was a successful expedition, and there is much to be learned from the data collected. A picture of a team of scientists retrieving one of the deep-sea robots from an 8-hour sampling trip.